7.24 points at 29 votes (rank 284). Someone who does not know "Battlehsips" has probably never visited school. 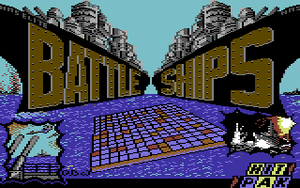 But while in the classic battleships the field is limited to a size of 8×8 fields (similar to a chess board: A1 to H8), the 64 version "Battle Ships" comprises a game area of 20×20 fields. Optionally you can raise the number of shots (usually 1 shot per round) to 4 shots per own ship with the setting "Salvo Fire On"; as you have 5 ships at the beginning this means up to 20 shots. Each time you lose one of your ships the number of shots then lowers by 4, so the chance to find and sink hostile ships lowers also. Single player against the computer: You compete with the computer opponent. It is not so dumb at all, but it distributes its shots generally by random generator and knows quite well what to do to finally sink a hit ship as fast as possible. Two players against each other. When placing the ships you are warned "Assure secrecy from player 2", somehow logical, if the opponent would peep, the game would make not much sense. Two up to theoretically infinite players. How come? Simple as that: An infinite number of 2 player games take place, whereby the corresponding winner plays after that anew and is then challenged by the same or the third player to player number x. Speciality: in this mode the opponents enter their names at the start of the match and can build up a highscore. After the decisions about Salvo Fire On or Off and the game mode have been made, the opponents position their ships one after the other. This happens as follows. You pick one of your ships with the joystick. If the yellow button "Rotate" is "Off", you can move the ship around the map after clicking it and then confirm the position with another press in the fire button. Each one field needs to be free between two ships. If the button "Rotate" is "On", you can turn the ship on the map by as many clicks as you wish in the list, if there are no other ships in the way. When all ships are placed as wished, you press the yellow "End" button. When alle ships are placed, there is no need of secracy also in the multiplayer mode. With the request "Player 1 fire XY Shots at NME" ("Enemy") a move starts. Distribution of the shots: You cover the map with the available number of shots (without Salvo Fire 1 shabby shot, with Salvo Fire = unsunk shipsx4). If you want to take back a shot, you simply click it once more. But beware: this is not valid for the last shot - this ends the distribution of the shots. It you wait too long, there is a kind of "screen saver" as "intermission" (a fight scene as described in the following as endless aninmation). This can be deactivated any time by the joystick. A fighting sequence follows, in which a ship shoots at the sea while being attacked by airplanes (which you can well forget right away as they only serve the graphical relexation). The single meaning of this sequence: if one of the shots, directed one after the other, has hit the ship of an opponent, you can see and hear an explosion, the ship that was hit sinks one level deeper below the water line. If a sheep was sunk, a life buoy appears ("S.O.S."). When all shots are made, it is the next player's turn, unless he has no more ships. In this case the game is over and there is a small end sequence (jinlge and "Player X your fleet is sunk"--> exposion of the "Victorious Fleet" by player Y, which then drives away gloriously). Technically, Battle Ships is rather filed. Although many graphical elements from title screen to fighting sequence do not have an important role for this at the end simple game principle, but are only accessory and therefore lose their impression after some repetitions, they do not hinder the game but lighten it up a bit. At the start it is recommended to share out the shots extensively and as spaciously as possible. But if the opponent has only few ships, it depends on how big the biggest is. As the green fields show where you have already shot, you have to think about where another ship can fit in. The fact, that ships with plan squares completely in a row can also lie diagonally, is often overseen. If you have hit home, you are facing with Salvo-Fire a tactical decision in the next round, which should depend on how many ships or shots you have still available. Either you cover everything around the black field with fire, that you will sink the ship in any case, advantage: the enemy has definitely 4 shots less in the next move. Only cover a smaller area around the black square, advantage: in the next round you probably know at least, how the ship was placed by rotate and you can save some shots into the blue. When searching for the position of a hit aircraft carrier you can save shots by keeping in mind, that it can be rotated but not mirrored (only 2 positions possible instead of 4). 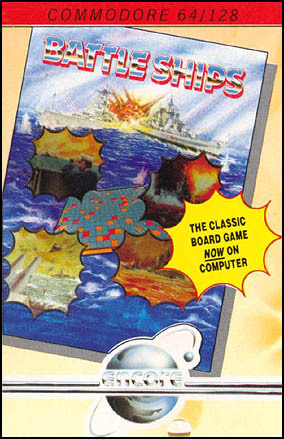 The game ends as soon as a player has no ships left. The other player has won. mombasajoe: "Games the world can do without. Boring as hell. And stringy. It feels like days pass until a game is over. How did anyone get the idea to convert such a type of game to a computer game? This is destined to fail as much as with Happy Families, Old Maid etc. The high point of dullness is the 2-player mode. That nobody cheats and keeps the eyes closed well-behavedly..."
Darkstar: "I found the game rather good at that time. A nice pastime for rainy afternoons (of which I feel that there were more in the past than today ;-). The 2-player mode also often kept us successfully from doing homework. The nice sound effects and the music complete the overall impression. It might be that this is all only my subjective memory of the old days, but anyway the game gets 7 points from me." TheRyk: "This is defintely an interesting approach of a C64 Battleships. Modifications of the original game like the bigger playing field and salvo fire are quite nice. No matter if the world needed a C64 Battleships or not, I find it well done and every now and then quite entertaining, either against the good AI or a friend. All in all, very good, i.e. 7 of 10 points." The Remember version from 1998 has a highscore saver. Theoretically possible but only in the mulitplayer mode, but the score can be pushed up without limit by playing against yourself, therefore recording this data does not make sense.